How Chantel Got Comfortable to Ask Questions and It Transformed her Year 11 Maths & English Results! How Chantel Got Comfortable to Ask Questions and It Transformed her Year 11 Maths & English Results! Thinking about getting started with Art of Smart but not sure if we’re the right fit for you? 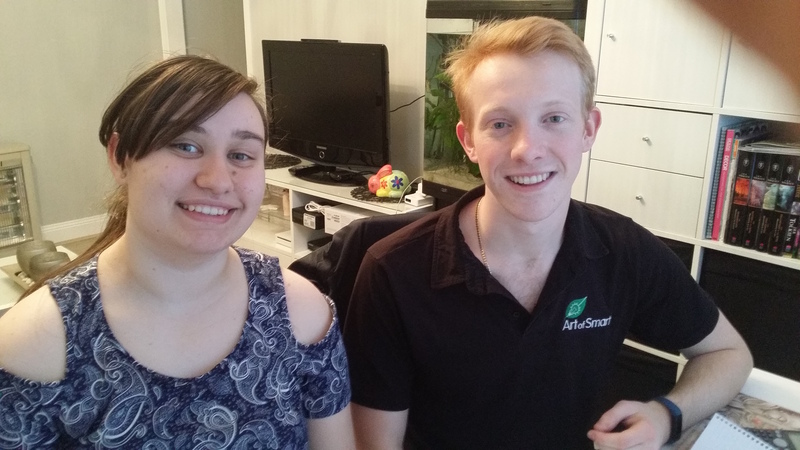 Rita and her daughter Chantel (Year 11) have been working with Art of Smart over the last 2 years across Maths and English. We recently chatted to Rita who shared her experiences in working with Art of Smart and the impact it’s had for Chantel’s confidence and results! Chantel and her Art of Smart coach Thomas! Prior to getting started with Art of Smart, what help was Chantel needing? When Chantel was in Year 7 she was an A in Maths, but as the years went by and she reached Year 9, she started slipping and fell to a C. We were concerned as to why this has happened as we were told by Chantel’s teachers in Year 7 that she had a strong foundation and would continue to excel. English was also Chantel’s weakest subject (low C’s) so also wanted helped with English. Chantel needed helped to elaborate on her points in particular. How did you hear about Art of Smart? I was looking on the internet for tutors via Google Search and found Art of Smart. I looked at the website that saw what Art of Smart offered. I liked what I saw so I got in touch! Was there anything that you were unsure of that may have prevented you from getting started with Art of Smart? I wanted to work with a large organisation as opposed to an individual tutor so that there was a chain of command if there was a problem. This way I knew I’d have the support to ensure we were always being looked after. 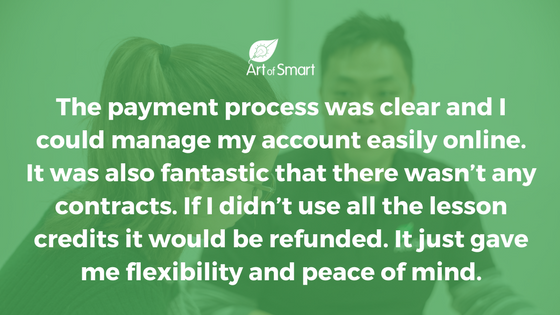 Why did you ultimately choose Art of Smart? When I rang I left message and I got a call back promptly within the hour!!! This was a very BIG thing for me. I then spoke to Laura and she was very informative, and made me feel confident about how Art of Smart could help Chantel. My overall feeling was that Art of Smart was very professional. The payment process was clear and I could manage my account easily online which I liked. It was also fantastic that there wasn’t any contracts and that if I didn’t use all the lesson credits I’d paid for, it would be refunded. It just gave me flexibility and peace of mind. Everything AOS said they would do they did. Laura said she would send me information and options for tutors within a time frame, and she did! I then booked and within 24 hours both tutors had called me to get started!! Customer service is a really big thing and AOS is up there! I have very high standards! What was the moment in working with Art of Smart that you knew you’d made the right decision? Why? What did we do? The moment occurred after a few lessons. It was the moment when I heard Chantel relaxing and actually ASKING Thomas questions (as she was very shy). To hear her ASKING questions was fantastic!! What has Thomas and Amy done to help Chantel? What have the results been? Chantel is a shy girl. She didn’t have the confidence to ask questions in class at school. Thomas goes through any questions Chantel has from school. If there is an exam, they’ll go through it and he’ll test her through the topics. Thomas also create mini-races with Chantel to see who can solve a question quicker. This was designed to help Chantel with time management as she was struggling to finish test in time and she’d lose marks. With Thomas’s help she’s been able to turn this around! 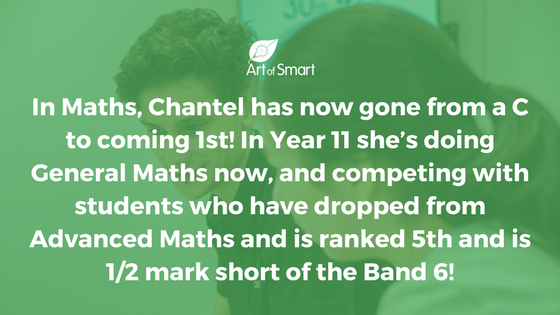 In Maths, Chantel has now gone from a C to coming 1st! In Year 11 she’s doing General Maths now, and competing with students who have dropped from Advanced Maths and is ranked 5th and is 1/2 mark short of the Band 6! In such a short period of time, this turn around is amazing. Thomas has really helped her with confidence – as this is what is came down to. Chantel looks forward to working with Thomas each week! English is Chantel’s weakest subject (low C’s) however we recently received Chantel’s report for English, and she’s moved into Band 5 – B level now! Her goal is to stay at this level as she wants to be Primary School teacher, which requires a minimum Band 5 in English. We’re very happy as it means with the improvement Chantel has made, she doesn’t have to go long way around to study Primary School teaching. She’s on track to get straight into Primary School teaching! What’s the best thing your tutor has done to support your child? Thomas is amazing! Firstly he’s come to every lesson. He’s always on time, and he’s always there. If you have questions, Thomas is always prepared to give time to answer the question. Thomas listens to what Chantel’s asking and ensures she’s understanding everything that is being taught. Thomas makes me comfortable and makes Chantel comfortable. The easiest way to sum it up is that Art of Smart tutors are professional! Recently, Chantel sat for her final Year 11 Maths Exam and received a mark of 33/35 and came first in her class! Thomas has given Chantel the confidence to succeed. It’s a true testament of how Thomas has changed a child’s life. We can never find the right words to thank him. Are you looking for a tutor who could change your child’s life? We pride ourselves on our inspirational coaches and mentors – just like Thomas!